Never try and calm itchy feet. Last Friday night we stayed at the stunning South Lodge Hotel as the first destination in our ‘Dog Friendly Hotel’ series. South Lodge Hotel is a luxury hotel in Horsham, West Sussex. The hotel provides stunning views of the South Downs and more importantly, not only welcomes, but pampers your four legged friend. 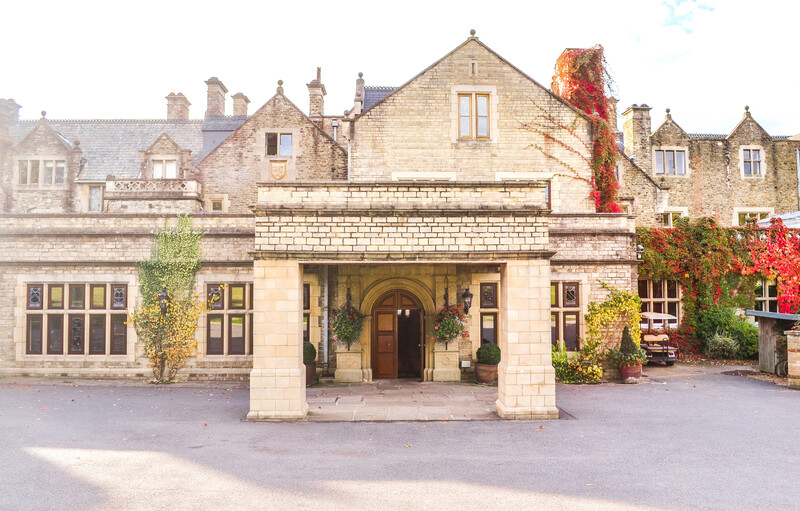 We were initially drawn to South Lodge Hotel due to the beautiful grounds, dog loving nature, and the fact we wouldn’t have to give up on a luxurious night away simply because we wanted to travel with Gus, Natalie’s French Bulldog. So, after finishing work on Friday evening we jumped on the train from London Victoria to Horsham station. The train journey only takes 55-minutes, meaning you can leave the city behind and start your relaxing weekend in no time. Furthermore, South Lodge Hotel is only an 11-minute taxi from the station. Now, although we’d arrived after sundown we could still fully appreciate the stunning facade as we drove down the drive way. We instantly knew the hotel was going to be gorgeous, and we weren’t wrong! Walking into an incredible open plan reception room, complete with a burning fire instantly made us unwind. How great are open fires!? Not to mention the smiling faces of the receptionists… even though that may have only been because we’d walked in with our handsome companion. Once we’d checked in, we were shown to our room on the Lower Ground Floor, spotting some fellow pups on the way. We were staying in a twin room with an en suite, it was beautifully decorated, spacious and had double doors leading straight onto the terrace (complete with a doggie bin) and hotel grounds – perfect for our extra guest. The rooms were completely set up to cater for Gus and all his needs. From his own bed, food bowls and chew toy, to organic food and a treat for bedtime. We can happily say he was pretty excited to see our room, however, after running around like crazy (thank the gods for amazing sound proofing) he soon relaxed on his bed while waiting for us to get ready for dinner. We were absolutely gutted we forget his bow-tie (and no this isn’t a joke) because he was coming with us. For dinner we had booked a table at The Camellia restaurant, one of the hotels many food offerings. It is beautifully decorated and has adorable potted plants in teacups… we’ll be stealing that idea! Blue Peter watch this space! Our table was located just outside the main restaurant so we were able to dine with Gus and were surrounded by fellow dog lovers and their pooches. We went to a dog brunch a few weeks before and luckily the dogs at South Lodge Hotel were much better behaved. If our lamb had gone flying due to tangled leads we would have looking for answers… although it would have more than likely been Gus’s fault. Now, earlier we mentioned not giving up on a luxurious weekend away while travelling with Gus, and one a those factors has to be the food. We can honestly say the food at South Lodge Hotel was amazing! All the food is locally sourced from Sussex and offers a twist on the contemporary. As we sat down we were offered complementary pumpkin soup with toasted pumpkin seeds, paired with bread and butter. The waiter told us “I think it will be fine”, well we can definitely confirm it was more than ‘fine‘, it was actually delicious. To start Natalie then had Pressed duck leg with citrus glazed cabbage, watermelon and peanut satay sauce, while I started with Ricotta, heritage tomatoes, strawberries and a rye cracker… both were a dream and we loved the mix of flavours. Then, we moved onto our classic British mains of Roast rump of lamb with potato rosti, crushed peas and mushrooms, and Pan Roasted chicken breast with pot roast heritage carrots, kale and roast chicken jus. We have to say we love a hearty meal and The Camellia definitely didn’t disappoint! Next, you can head to The Billiard Bar for an after dinner cocktail with your four legged friend in tow, however we opted to hit the hay as we wanted to be up early for sunrise (because who regrets a sunrise) and to explore the hotel’s grounds. Plus, with what we’d seen so far we knew it was going to be stunning. The next morning we were up early, 7am to be exact, to take in the multicoloured sunrise. The rooms come with a coffee and tea maker (which, if we’re honest, took us about half an hour the night before to work out! ), meaning we where able to make ourselves some hot drinks, grab the complementary shortbread and settle down on the terrace to watch the sky turn pink in our fluffy dressing gowns. What else could you ask for?! Luckily there are walls between the patios so no one had to see our bedraggled faces so early and we had some privacy! After we’d eventually moved and got ready we headed down to breakfast at The Camellia restaurant. We even managed to grab our favourite table… of course not too far from the buffet in the adjoining room. The buffet offered everything you could ask for, from yogurt, granola and fresh fruit, to a full english and delicious pastries, we were in breakfast heaven. We can highly recommend the pear and apple juice for a refreshing start to your morning. Plus, Gus was able to sit with us while we ate, making friends with the fellow puppies and maybe sampling a sausage or two… don’t the worry the waiter told us it was fine! After we’d eaten our way around the buffet, more than once we must admit, we grabbed our jumpers and headed out for a morning walk around the hotel grounds. With the leaves falling from the trees it was the perfect autumn morning. Not to mention it’s in the perfect location to explore the local attractions, including South Downs National Park, Hampton Court Palace and Brighton Pier. We’ve also heard The Crabtree across the way also has some delicious Scotch Eggs! So, after we’d spent early morning exploring the hotel and grounds it was time to check out of this stunning hotel. We opted to head down to Brighton Pier for the day, jumping on the bus directly outside South Lodge Hotel which takes 45 minutes down to Brighton. Meaning we spent our morning walking through the countryside and were by the beach by lunchtime… could you ask for anything more?! We have to say the South Lodge Hotel was an amazing place to stay with our four legged friend, not only were we able to walk Gus in an amazing setting, we were also able to dine with our pup and spend quality time with him. In addition, we were still able to relax and indulge in a little bit of luxury during our stay. Therefore, if you’re looking for a Dog Friendly Hotel in West Sussex we can highly recommend South Lodge Hotel. We promise you won’t regret it… and neither will your precious pooch. We love to travel with Natalie’s French Bulldog Gus, but we often find it hard to find hotels around the U.K who are willing to host our four legged friend. Therefore, we set out to discover the best Dog Friendly Hotels around the U.K. Hotels who not only allow you to bring your pooch, but also cater for them and make them feel welcome.